The startling extent to which violent wild fires, similar to those that ravaged large swathes of California recently, affect forests and crops way beyond the boundaries of the blaze has been revealed. A pioneering new study by Professor Nadine Unger of the University of Exeter and Professor Xu Yue of the Institute of Atmospheric Physics in Beijing, has revealed that pollutants released by the devastating wild fires can affect crop and vegetation growth hundreds of kilometres from the fire impact zone. The study examined how ozone and aerosols—two by-product pollutants of wildfires—influences healthy plant growth in areas that are seemingly unaffected by the destructive natural disasters. It found that there was a significant reduction in plant productivity in areas far away from the fire’s borders. The study suggests that fire pollution could pose an increasing threat to regional, and even global, productivity in the warming future world. Professor Unger, from the University of Exeter’s Mathematics department said: “The impacts of these wildfires on public health has been widely recognized, but the impact they also have on our ecosystems is less known. The impact of fire on the Earth’s carbon budget has been well documented. Each year, global fires directly emit large amounts of carbon directly into the atmosphere. This immediate carbon loss is partially compensated by a boost in new ecosystem productivity, driven by changes to canopy composition and soil respiration. 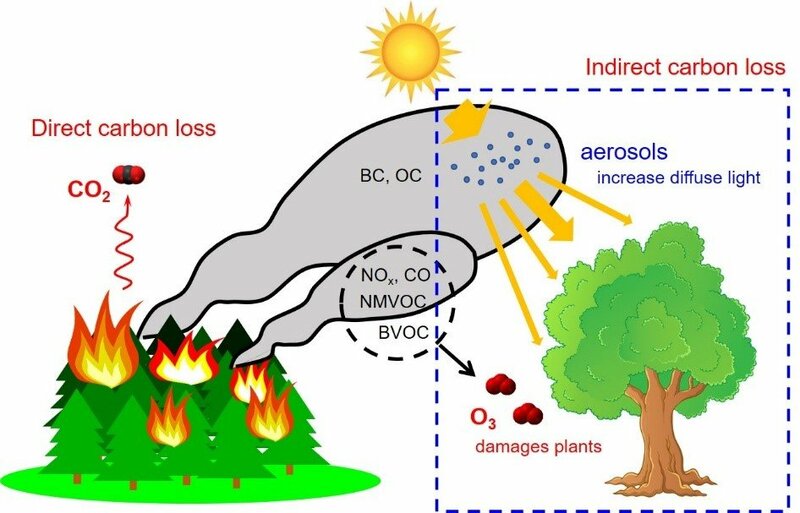 Indirect carbon loss caused by fire O3 and aerosols. For the study, scientists used state-of-the-art computer models, together with a vast array of existing measurement datasets, to assess the separate and combined effects of fire pollutants from 2002-11. 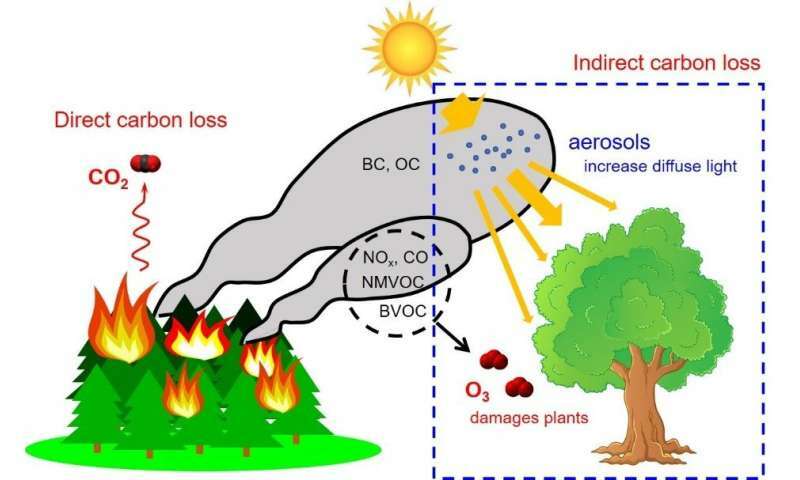 It found that the Gross Primary Productivity (GPP) – essentially plant photosynthesis—was significantly reduced when the amount of surface ozone increases. Crucially, this reduction in GPP was not confined to the areas immediately in and surrounding the fires. It found that areas downwind from the fires, hundreds of kilometres away, experienced significantly reduced plant productivity. Crops and vegetation in sub-Saharan Africa were identified as a particularly vulnerable hot spots to fire ozone pollution damage. The study suggests that the ecological impacts of this air pollution is far greater than previously thought—potentially impacting crop production that is crucial to the survival of rural, remote communities.